for me is browsing the post Christmas sales. I realise that this article is a little odd juxtaposed with my previous one, but I adore reading wishlists and since it is Christmas, I couldn't help but make my own. Everything here is at a reduced price and in the sale. I hope I might save you some pennies! 1. Miss Patina Dalloway Dress - Look, there are bunnies on the sleeves! I am completely sold. If only donning a garment had the power to invent yourself a career like on the kids shows. I can imagine stepping in to this only to pop through the magic curtain and transform in to a piano teacher. 2. Accessorize Swallow Snood - You may see a bit of a recurring theme here, as I could and maybe did spend hours browsing the Accessorize website. Some folk like golf, others like gardening, I stare at pretty accessories to relax. But as Moana's Gma says "but once you know what you like, well there you are"
3. Accessorize Flower Leaf Comb - Along with the beautiful snood, I can't get over this stunning hair comb. It's so beautiful, the design is so intricate and has been reduced to only £7.50 in the Accessorize sale! I would definitely love to try out some new styles in the new year and experiment with hair combs. 4. Miss Patina top - This top is right up my street! I love the dusty pink hue, lace touches and flattering neckline. I have fallen for everything on Miss Patina website, it is resembling my Modcloth wishlist! 5. Scent Circus Saucy Pud - I reviewed a darling selection of melts back in autumn but Scent Circus is one of those brands I keep coming back to. The melts are so adorable and make perfect presents, especially those inside the mystery Limited Edition boxes that come out each month I get overly excited. I'd love to try more from the festive range before they go - plus these are currently reduced in price, bonus! 6. Accessorize slipper boots - These boots are so perfect for the colder months. Someone will have to stop me from wearing them outside, along with my dressing gown to the park - hey, it has ears! 8. Ted Baker set - Boots is choc a block with gorgeous half price perfumes and gift sets this time of year and this Ted Baker set immediately caught my eye, along with the Soap and Glory Girl o' Whirl collection (down to £6 from £12). Everything you need to smell like pudding and flowers all year round! 9. Ghost gift set - The Ghost fragrance has always been my mum's favourite and now is mine too. It's so soft, ethereal and delicate - and smells like turkish delight! I am longing to try Ghost Sweetheart. 10. Vintage Tea Party journal - I am cheating slightly with this entry as I don't believe it's in the sale - but it's too pretty not to feature! I had a quick skim through the Vintage Tea Party and wanted to curl up on the floor of TK Maxx and read it for hours. I'm saving up my pennies to collect the whole series! 11. Accessorize nail polish - I was happy to see the Accessorize polishes reduced as I've been so curious about them! Usually I stick to Barry M, but the bottles are so pretty and I love this shade. 12. Accessorize Chelsea boots - I featured these beautiful ankle boots back in my October wishlist - only now they are reduced! I will happily wear ankle boots all year round, they go with everything. 13. Accessorize Vine ring - Finally we have this gorgeous ring from Accessorize. It's so romantic and perfect, I love the entwined leaf design! The gold version is reduced but I adore the rose gold version. Oh yes, I really need to look at all of the sales! I'm sure there is some amazing deals! You always pick the most gorgeous things. I'm in love with the pink skater dress with the pretty detail. My goodness Liz you have the best fashion sense ever. I absolutely love all of your picks especially that adorable pinafore dress/blouse combo and the tan boots. How sweet is that journal too? My dream wardrobe would be full of pretty dresses like yours. Hope you had a lovely Christmas beautiful lady! 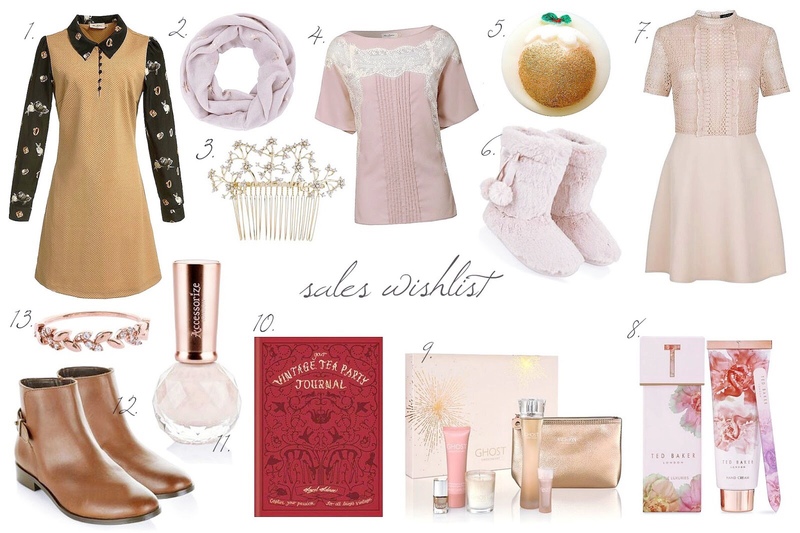 Love this wishlist, those boots and dress are gorgeous!